Performers include: Chad Michael Murray, Billy Gardell, Drake Milligan, Kevin Fonteyne, Christian Lees, Jonah Lees, Trevor Donovan, Keir O’Donnell, Jennifer Holland, Margaret Anne Florence, and Kerry D. Holliday. A music business drama, the Sun Records TV show unfolds in Memphis, Tennessee, during the first turbulent years of the Civil Rights movement and the birth of rock ‘n’ roll. 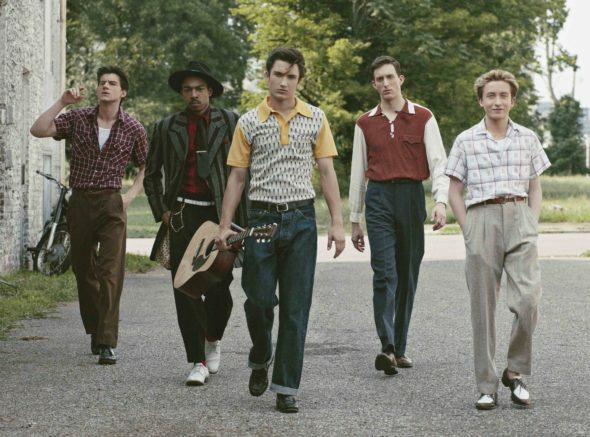 Sam Phillips (Chad Michael Murray), shepherds young musicians Johnny Cash (Kevin Fonteyne), Elvis Presley (Drake Milligan), Carl Perkins (Dustin Ingram) and Jerry Lee Lewis (Christian Lees). These up-and-coming white musicians combine hillbilly country music, with the ’50s R&B sound of African American artists. Drawing on the seminal works of Muddy Waters, B.B. King (Castro Coleman), Fats Domino, and Ike Turner (Kerry D. Holliday), these artists made musical history. The series documents them, as they rocket to fame. Meanwhile, the nation is swept up by political changes and protests. What do you think? Do you watch the Sun Records TV show? Should it be cancelled or renewed for another season on CMT? There has to be another series, it is excellent series, and isn’t it a series that leads up to one of the most famous jam sessions of all time, Elvis, Cash, Jerry Lee and Carl Perkins jamming together at Sun Records? Love it, please, please renew! Please don’t cancel. This is a great show!! Renew it! We loved it. Bummed when u cancelled it!! I absolutely LOVED the show! I have been anticipating a come back. Really sad to hear that such a great show did not even get a chance. Been waiting for it to come back. Now I’m bummed to find its been canceled. I’ll keep my hopes up though.